Home Core Lessons Dojo Featured Post What Is The Black Belt Project? 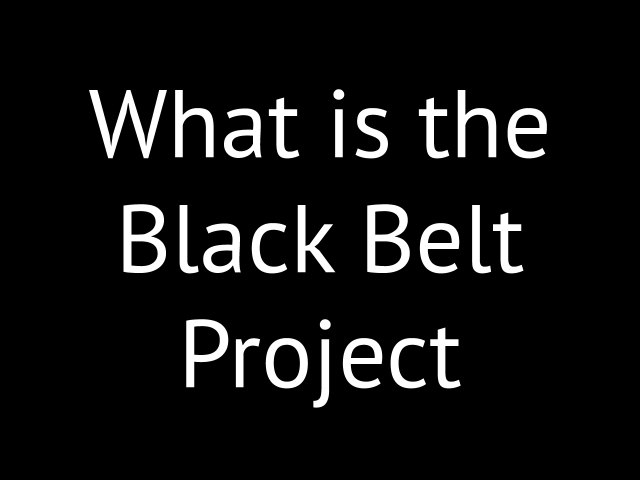 What Is The Black Belt Project? The Black Belt Project teaches you how to master one small part of your life and then incrementally expand that mastery throughout everything you do. The ultimate outcome of the Black Belt Project is to master everything you do and become a complete master of your life. What makes the Black Belt Project unique is that instead of me just telling you what steps you need to take to achieve total mastery - or, as I call it, become a black belt - I actually do the steps I teach. I then share my results with you so that you can see that my strategies do indeed work and have the confidence they will work for you in your own life. Black Belt Project Insider You'll see what my own personal black belt project looks like. I will share with you through blog posts, podcasts, videos and even an iTunes series exactly where I start, the steps I take and what level of black belt I am at the moment. The Belts of my Black Belt Project I call each of area of focus in my life a "belt". I have created eight belts that start at a white belt project and continue through to the black belt project. How I break the bad habits that are hurting me I show you how I break the bad habits that hold me back and how you can break bad habits too. How I get everything out of my head and into checklists I show you how I get everything I need to do out of my head and into a system of checklists. How I improve my checklists Once I have everything out of my head and into my checklists, I look for ways to improve my checklists so that they are totally complete, in the best order possible and that I can work through them faster. My mental strength training program I show you how I use my checklists to implement a mental strength training program that gets me doing what I need to do through a strategy of progressive resistance. How I measure how much of my life is at a "black belt" level I show you how I determine what level of my life is at black belt at any moment in time. How I approach excellence and raise the bar I show you how I set a higher standard of what I expect from myself to push me to be the best I can be have the best life I can imagine. That's a basic outline of what the Black Belt Project is all about. To get started on your own Black Belt Project or just to follow along with my progress, scroll down a little bit, put your email address in the box and click the button to start. Or use the one in the sidebar. That'll get you on my email list so I can keep you up to date.